"… Wishing on the Moon represents the Denny Zeitlin Trio at the peak of its powers, on one those nights—this was recorded live at Dizzy's Club Coca Cola in New York in 2009—when all the gears meshed, and all the stars aligned around that shining moon. " "There’s so much for the ear on jazz pianist Denny Zeitlin's new live trio album, Wishing On The Moon, that the mind boggles… traditional straight-ahead lyricism banked up against a restless, avant-garde spirit of total invention… It takes a certain kind of genius to balance lyricism with adventure. Zeitlin, who practices psychiatry, is that genius, an artist who truly understands what it means to play in the clouds, while holding onto the audience with entrancing music, regardless… Wishing On The Moon celebrates jazz, in all its wondrous forms. Unapologetically, without ego. Just pure, true trio music as Denny Zeitlin’s nature intended." 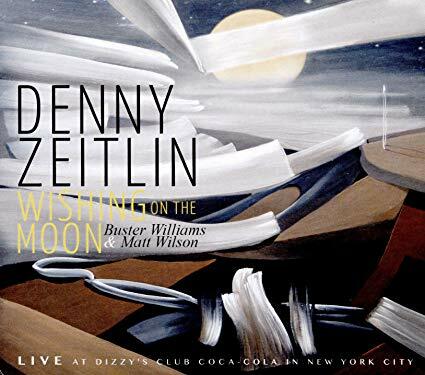 "Recorded live at New York's Dizzy's Coca-Cola in March 2009, this newly released album features Denny at his explorative best, taking standards apart and reassembling them with curiosity and daring…"
"Denny Zeitlin’s Wishing On The Moon is a vital document of a trio that’s been gigging for some eighteen years, led by one of jazz’s most innovative keyboardists of the last half century and completed by a rhythm section of notable leaders themselves… "
"… a killer 2009 date with his long time trio live from Dizzy’s recorded when all the stars were perfectly aligned… The jazz piano trio is so in the moment, it almost feels like they weren’t aware they were being watched by an audience… this wonderfully played date is a solid reminder of why we became music fans in the first place…"
"…I’ve been listening to Denny’s music in performance and on recordings for over 50 years and I view each new opportunity to do as another episode to hear his quest for truth… Wishing on the Moon continues his search for honest artistic expression at the very highest level. It's been a pleasure to be able to accompany him on this journey."